Iams Prostora Max (15 Tabs) is made with Bifidalis, a patent pending, clinically proven strain of a live and active culture, to help nutritionally maintain your dog's digestive balance. 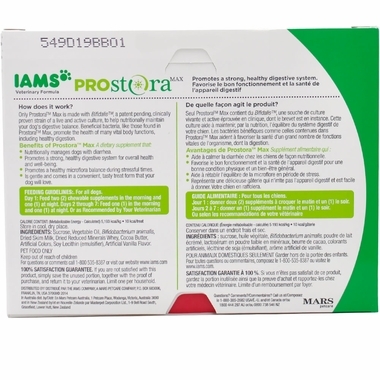 Beneficial bacteria, like those found in Prostora Max, promote the health of many vital body functions including healthy digestion. This formula is available only through your veterinarian. 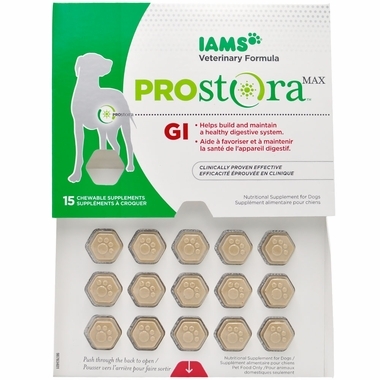 Nutritionally manages dogs with diarrhea. Promotes a strong, healthy digestive system for overall health and well-being. Promotes a healthy microflora balance during stressful times. Is gentle and comes in a convenient, tasty treat form that your dog will love. Save even more by buying the 4 pack. 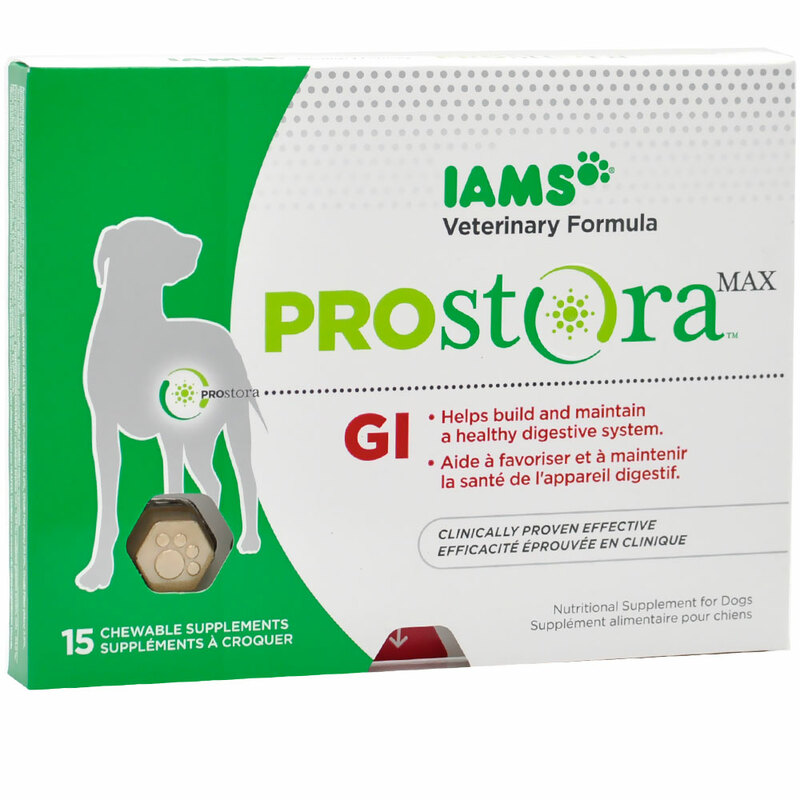 NOTE: We recommend Vaccine or Priority Shipping for Iams Veterinary Formula Prostora Max. 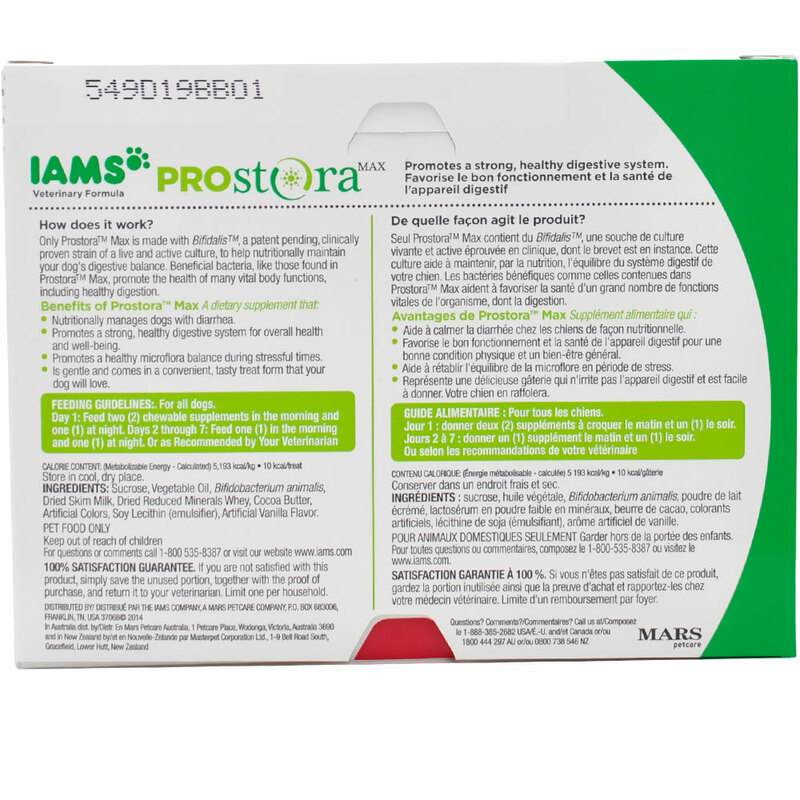 Vaccine Shipping includes ice packs and is shipped via overnight delivery which is the best way to ensure Iams Veterinary Formula Prostora Max is received at a cool temperature. Other shipping methods are not guaranteed to arrive quickly or cold. Sucrose, Vegetable Oil, Bifidobacterium animalis, Dried Skim Milk, Dried Reduced Minerals Whey, Cocoa Butter, Artificial Colors, Soy Lecithin (emulsifier), Artificial Vanilla Flavor. Directions: Same effective dose for all dogs. Day 1: Feed two (2) chewable supplements in the morning and one (1) at night. Days 2 through 7: Feed one (1) in the morning and one (1) at night. Contains a source of live (viable) micro-organisms.